Carniny Youth Under 13s were on top form this week with a welcome ‘derby’ win over neighbours Ballymena in the NIBFA National League Cup. There were only two other teams in action last Saturday, both Cup games, with the Under 15s losing out to Crusaders despite a late resurgence in the second half of the game. The Under 14s struggled with the wind in their game against Bertie Peacocks, losing out to the Coleraine side, with all the opposition goals scored in the first half with the wind on their backs. The Under 13s will now meet Linfield in the Cup Quarter Finals with the Under 14s paired against Oxford Utd Stars as they drop into the Plate competition. The Under 15s will play the winners of Dungannon or Ridgeway in their Plate competition whilst the Under 17s will meet Warrenpoint or Loughgall in their next round of the Plate. Carniny Youth 5, Ballymena United YA 2: Carniny struck first with new signing Benji Magee bursting through the Ballymena defence and scoring at the second attempt. Ballymena then equalised when Carniny failed to clear their lines as the first half finished 1-1. In the second half with Carniny now with the wind at their backs took control of the game as Ballymena found it difficult to get it out of their own half and Aidan Graffin got his first and Carniny’s second when he headed past the keeper on his second attempt. Kyle Robinson made it 3-1 when he followed in after Lee Lynn’s effort. Benji Magee got his second to make it 4-1 after a neat side foot finish past the keeper to effectively kill the game off. 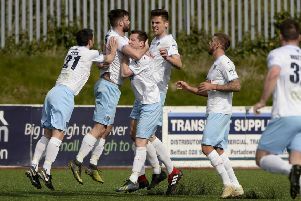 With five minutes to go Ballymena scored to make it 4-2 but the result was never in doubt and Carniny made it 5-2 just before the end with Aidan Graffin’s second. The reward for Carniny now is a tough game against Linfield in the quarter final. Carniny hope to bring this performance into their league games and kick start their season and they have a must win game this Saturday against Loughgall in the league. Carniny: McNicholl, Holland, Robinson, Young, Simpson, White, Lynn, Hamilton, Anderson, Hunter, Graffin, Magee, Adger. Carniny Youth 0, Bertie Peacock 5: Carniny returned to action after the holidays with a tough tie in the National League cup against a very good Bertie Peacock side. This game was played in difficult conditions and Carniny were right up against it from the start. Bertie’s had the lead after five mins with a tidy finish. Bertie’s added another two in quick succession to add to Carniny’s woes, while two more virtually killed off the tie. Carniny rung a few changes for the second half and began a lot brighter and soon had Bertie’s on the back foot. With all the possession no clear cut chances were made. Bertie’s were experiencing the difficulties of the strong winds with Parker having a quiet second half. Carniny: Parker, Winter, Clyde, Fleming, Gordon, Close, Moag, Kirk, Courtney, McKitterick, Hemphill, Woodin, McAllister, McDonald. Carniny Youth 1, Crusaders Youth 2: This league cup fixture at Mallusk was Carniny’s first game after a long Christmas break and the Carniny boys made hard work of it. Carniny were two goals down in the first half with Shea O’Brien making some top saves to keep Carniny in the game. With time running out Leon Carley rounded the Crusaders keeper for a simple tap in to give Carniny a good chance of at least forcing extra time but try as they did it just wasn’t to be their day. Carniny Youth 1, Coleraine YA 2: Coleraine, who were bolstered by the inclusion of several of their Colts team came more into the game and scored two quick goals, the second a superb shot from outside the penalty area which gave Owen Marquess little chance. Carniny came back into the game and were awarded a penalty when James Price was bundled over in the area. Tyrone Balmer scored from the spot but Carniny were unable to force an equaliser. Carniny: Marquess, Calderwood, Bunting, McCartney, Hagan, Price, Johnston, Killough, O’Mullan, Balmer, McKernan, Millar, Doherty, McComb, Jaworski, Mairs.